Martia made quite the impression in Kelowna this year – pedaling around town with a big clunky air-cast on her left foot! Her voice shakes as she tells me her story but as we talk (and laugh! ), it becomes clear that she is unwavering in her conviction that a bike is “not just a toy” but a vehicle for independence, community, health and joy. 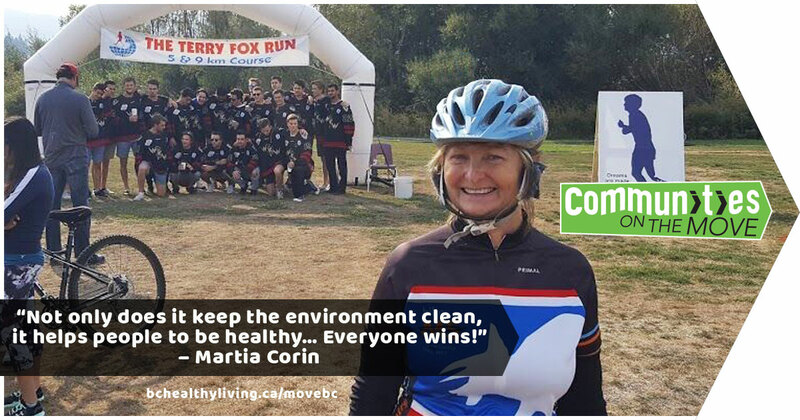 Working as a health professional, alpine ski & swim instructor, and wellness entrepreneur, Martia says riding her bike expresses her “value of helping others and promoting health while staying in shape”. Martia has a unique perspective having lived in Boulder, Colorado, a city with a reputation for making biking, walking and transit as easy as a “Hop, Skip and Jump” (which is what they call their famously convenient transit service). A model for other bike friendly cities. Comparing Kelowna to Boulder, she says: “what I noticed is that here there is still this entanglement between cars and bikes. Some car drivers don’t even realize that bikes are on the road.” Although Martia credits Kelowna for having some good bike lanes on the main streets, she says there are other areas where it just disappears. Martia believes that a consistent network throughout a city or town is what is needed to get more people feeling comfortable and safe on bikes. We couldn’t agree more! And if you agree, please click on this on-line petition to send a message to decision-makers in Victoria about the need for more active, healthy transportation options. p.s. Martia says, her foot recovered from the reconstructive surgery BETTER because she figured out a way to still keep biking! !